For me it is a sort of madness to collect progressive rock from bands which are not famous yet. Of course it has to have some quality in it. This Winter Machine was one of those bands. When I was on Facebook one day, I saw a post of the band This Winter Machine. They were searching for an interview and a cd review of their first album The Man Who Never Was, which was placed in the Dutch IO Pages magazine. I reacted to the post that I could deliver it to them. After that I got a free download of the album. 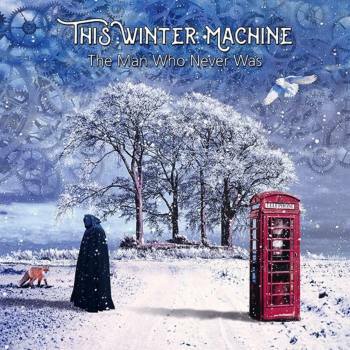 This Winter Machine is a band from the UK and The Man Who Never Was is their first album. After I had listened to the album for the first time I was flabbergasted. It was almost unreal. What a marvelous debut album this was. It reminded me of Marillion, IQ and a little It Bites. The music wasn't dated, it was neo progressive rock at its best. This Winter Machine is not a band which brings a new dimension to the progressive rock. But the band sounds great in what it does. The line-up mentions just first names, but what is in a name? This Winter Machine's line-up is: Al (vocals), Jevo (guitar), Marcus (drums), Mark (keyboards) and Pete (bass guitar and pedals). The brilliant album opens with voices and a piano on the background. This is the start of the title track The Man Who Never Was. Tension is built up with dark keyboard parts. Great vocals break through the keyboard atmospheres. Until this moment the song is really modest. After several minutes the rest of the band take part in the song. Lingering guitar parts, which have some IQ influences, for the highlights of this part of the song. The total time of the song is 16 minutes. The greatest part of the song is lingering and modest. Personally I like this atmosphere a lot. At the end of the song different atmospheres are added, these really fit together in a great way. All transitions are perfectly executed and remind me of Marillion in the early days. Technically there's nothing wrong with this band. The Wheel starts with clean chorus guitar and impressive vocals. The tempo is low once more. In the middle of the song there's a tempo change. After dark rainy atmospheres the guitar gets more powerful and the tempo goes up to mid-tempo. The solo which follows is genius. It's more or less IQ-style. The rest of the song is in up-tempo staccato style. I really like this change. Lullaby (Interrupted) starts as a real lullaby of course. Children's voices are completing the intro. After that 80s style keyboards are taking the lead in this song. After this long intermezzo heavy guitars are coming in. The guitar parts are slightly psychedelic. They are pushing the song to a great high. The song is completely instrumental. After Tomorrow Comes starts with a classic piano intro. Soon modest vocals are coming in. The song is low-tempo and very melodic. After a rather heavy part the song goes back to an intermezzo of piano and guitar. The guitar solo in the song is great and could be done by John Mitchell. The song is brilliant in my humble opinion. The album closes with Fractured, a 10 minute song. The song starts in staccato style and it reminds me of IQ once more. The guitar parts are fabulous. The song is mainly mid- to up-tempo. Besides the nice guitar parts, the keyboards are colourful, together with a great rhythm section it makes This Winter Machine a revelation to me. For all who love Marillion and IQ, this is an album which certainly deserves a chance. I am really in love with this album and I am sure that this album will be placed in my personal top 10 of this year. I am curious how the band performs live and how it will develop. The rating is simple this time, 5 points out of 5!